Total joint replacement is one of the great orthopaedic surgical advancements. 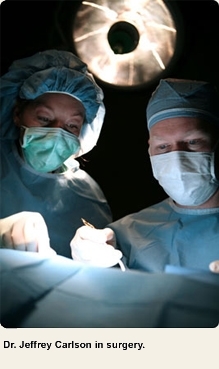 Surgeries of this type often involve conditions such as Rheumatoid Arthritis, degenerative arthritis or joint damage. The orthopaedic surgeon observes and manages the disorder to determine the most beneficial time and type of surgical intervention. Just as no two patients are alike, no two joint replacements are exactly the same. That’s why our care is precisely focused on the unique medical and lifestyle needs of each patient. In total joint replacement surgery, an orthopaedic surgeon replaces an arthritic or damaged joint with an artificial joint called a prosthesis. While the hip and knee are by far the most common joint replacements, our physicians also have in-depth experience with shoulder replacement surgery as well as elbow, hand, ankle, and other joints. The joint replacement surgeons at Orthopaedic & Spine Center (OSC) are specially trained, experienced and skilled in total joint replacement. On average, joint replacement surgery patients are hospitalized for three to four days. A highly qualified team of nurses, physical therapists work with you, your surgeon, and the total joint team to keep you comfortable and progressing forward. The results of our comprehensive approach to joint care are overwhelmingly positive. To schedule an appointment with our joint doctors, give us a call at (757) 596-1900. Visit our Contact Us page for information on our location and office hours.